DaveLunt.net - Dr Dave Lunt | Why can’t Nature just copy and paste? Why can’t Nature just copy and paste? Home > Misc > Why can’t Nature just copy and paste? 29 Sep Why can’t Nature just copy and paste? 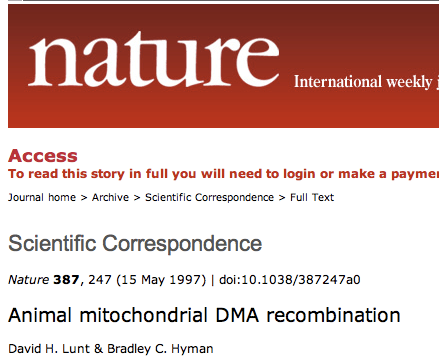 I just noticed that an old publication of mine has a typo in the title on the Nature website “Animal mitochondrial DMA recombination”, anyone want to guess what the error is? Web of Science has the correct title, Pubmed has the correct title, and it used to be correct on the Nature website, but somehow they have gone there and broken it. It’s an easy typo to make, M and N are adjacent keys. Easy if you are retyping stuff- but who on earth retypes journal article titles? You are professionals, copy and paste it from a reliable source. Jesus. What makes it worse is that when this paper (the paper that got me a job) first came out early on the Nature website they had spelled my name wrong! Adjacent keys typo again. They fixed it eventually, but it took a while. When you are a postdoc applying for jobs it only adds to the stress. So I decided to email them to let them know. After about 10 minutes looking for an appropriate way to contact them on the website I’ve just given up. Hey, I’ve got a job now, and it makes Nature look stupid not me. Lunt, D. H., and B. C. Hyman (1997) Nature 387:247-247. PDF Animal mitochondrial DNA recombination (no doi in my citations anymore as it points to a webpage with a stupid unprofessional typo).